TORONTO -- Ontario's finance minister is apologizing for referring to male and female hospital workers as "eye candy" during a funding announcement in Toronto on Thursday. Charles Sousa's comments were called degrading by Progressive Conservative legislator Lisa MacLeod. Sousa initially said his remarks were meant to thank the hospital workers standing behind him, and said the comments were taken out of context. He has since posted an apology on social media, saying his choice of words was "inappropriate." In a separate incident on Thursday, MacLeod took Economic Development Minister Steven Del Duca to task for calling a question she asked at the legislature "adorable." Del Duca apologized for his remarks and says he used a poor choice of words in his response to MacLeod. 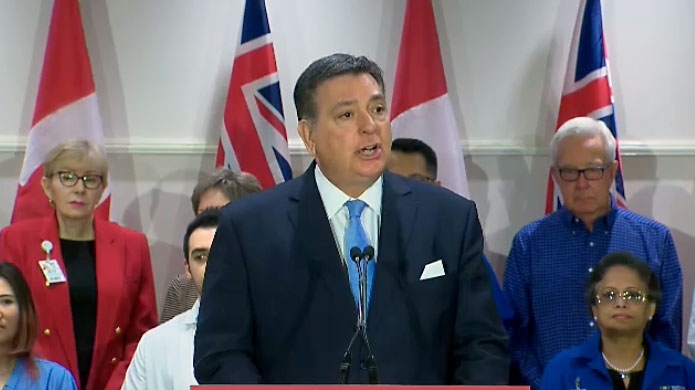 Ontario's finance minister Charles Sousa speaks at a Liberal health care funding announcement on March 22, 2018.